Two of Orange’s most renowned cooks will team up in one of the region’s most iconic settings for the signature event of the Orange Apple Festival this weekend. 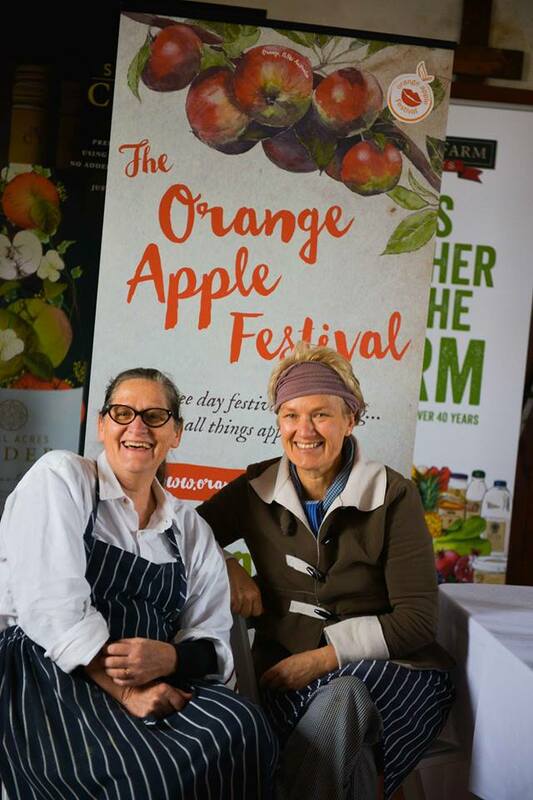 Josie Chapman of ‘The Convent’ fame and legendary food educator Lesley Russell will present ‘The Orchard Lunch’ at Bite Riot Apples in the foothills of Mount Canobolas on Sunday from 11.30am. Owner of Bite Riot Apples and festival committee member Fiona Hall says the event, like the festival, is all about celebrating our city’s love affair with the apple. “We’re so excited to be working with Lesley and Josie on this event, which connects the producers with the people who love our apples” she said. The event is a collaboration of several local businesses, including cider producers Small Acres Cyder and Sacred Valley Cider who are providing the lunches’ liquid component. The Bite Riot team will also be conducting an educational tour of the packing shed, state of the art processing facilities and orchard, prior to the lunch at 10am. Live music will be provided by talented local musician Matt Arthur. Mrs Hall said the event has been made possible only with the help of festival sponsor Harris Farm Markets and the team at Brand Orange. Tickets are $85 per person. To book phone 02 6365 3477 from 9am to 5pm Monday to Friday, or email sales@cherryco.com.au anytime to request tickets. Managing 1,000 tonne of fruit in the recent cherry season, Fiona hasn’t had the time to think about the eventful year ahead until now. 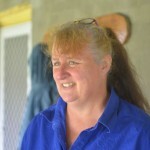 Fiona is managing director of Caernarvon Cherry Co, a holistic cherry growing, packing and marketing operation with a team of 22 growers located in Central NSW. The business supports growers from agronomy to harvesting, marketing and reporting back to growers. In the 2013/14 season, Caernarvon Cherry Co handled 1000 tonne of fruit, equating to 10 per cent of the Australian crop. The company exports 60 per cent of the crop to Malaysia, Indonesia, Hong Kong, Vietnam, Singapore, Dubai and Russia, with the balance going to domestic supermarkets. Also, Fiona & Bernard Hall co-own (with Tim Hall) Bonny Glen Fruits, growing apples over four properties located around Orange and two cold storage properties where they pack market apples for themselves and other growers under their ‘BiteRiot’ brand. She will use her Nuffield Scholarship to investigate how to close the gap between farmgate and retail returns in the apple and cherry industries. “Our industry adds three times the value of our crop in packing, processing and sorting – I want to look at how we can achieve more value at the farmgate for producers. To understand this I need to study how large packhouses rationalise, streamline, become more transparent, value-add, improve packing, market, use real-time reporting and of course innovate,” she says. Fiona believes part of the solution is developing an export culture to ensure a sustainable future for growers. “The industry is under a lot of cost pressure, particularly labour, and to be able to grow we need to take advantage of the opportunities of our clean, green and safe reputation and our location in Asia. With considerable experience in exporting of cherries, I would like to implement similar strategies into our apple operations,” she explains. Fiona will visit the UK, USA, China and New Zealand during her studies. Supported by Horticulture Australia Limited and the Australian Government, the Apple and Pear Australia Limited is also supporting Fiona’s Nuffield Scholarship as part of its strategic plan to encourage the development of future leaders in horticulture and export expertise. Nuffield Australia is an organisation, which provides an opportunity to Australian farmers to travel overseas on an agricultural research scholarship. 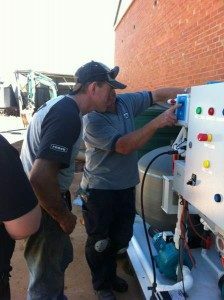 Geoff Bliss from Wobelea has spent the past week installing a Nylate system for both the apple and cherry grader dumps. The nylate system sanitizers the water in each of the cherry dumps and other tanks where all the cherries are water flued onto the belts. This investment will further enhance our quality control of our fruit. The system can be able to remotely accessed (via modem, soon to be web based) by Wobelea to check on the levels and to assist if any problems. Reports are automatically generated are stored for Fresh Care audits.